Protein plays a critical role as the building blocks of our body.They are involved in almost all the functions of the body,which are linked to growth and managing wear-and-tear of body cells. Regular intake of appropriate amounts of protein is essential for the production and growth of new cells.Our skin,nails and hair are made up of protein which form our body's protective layer and protect the body from foreign matter like germs and dust. 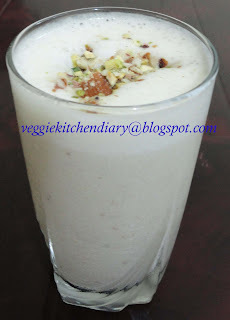 Here is one simple milkshake made with dry fruits ,banana and goodness of milk packed with full of protein. A perfect healthy evening snack for the kids. 1.Grind Almonds and pistachios to a coarse powder. 2.Blend together Dry fruits powder,ripe bananas,sugar,milk, and crushed ice in a mixer till smooth. 2.Pour into individual glasses and serve immediately garnished with almonds and pistachios.